FarWEB IT gives you access to the latest technologies. FarWEB IT thoroughly analyses your needs and your IT systems. FarWEB IT recommends the best options for your needs, so you can make an informed decision. FarWEB IT rigorously monitors and protects your systems, developing a comprehensive and proactive security strategy. FarWEB IT will become your digital watchdogs! Efficient backup and data recovery are essential to avoid disastrous consequences! FarWEB IT is available for your users and operations with 24/7/365 technical support. Information technologies can be a real challenge for entrepreneurs. Managing an IT system is an additional task on the managers’ already busy schedule. Fortunately, FarWEB IT is there to provide technical support for the IT equipment and software the businesses need, according to their growth and needs. Located in Sherbrooke, Eastern Township’s main economic center, FarWEB IT is near you to fulfill all your IT requests. With our help, your business will easily be able to grow at the same speed as technology. 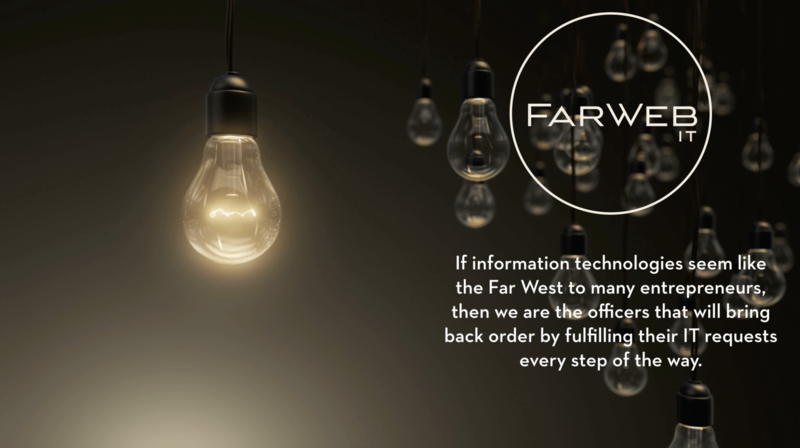 After all, even if the digital universe can seem complicated, it’s not the Far West; it’s FarWEB! NEED TO SORT THIS ALL OUT?